A companion to the book "Fair Trade: A Beginner's Guide." 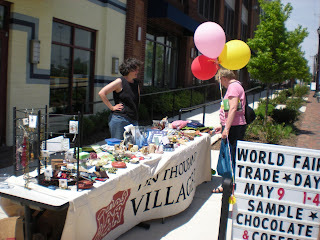 One of my first official Fair Trade gatherings was the 2002 convening of the NEWS! (Network of European World Shops) conference in Belgium. It was there that I met a delegation from Finland, who shared with modest pride the story of a cargo ship—dubbed Estelle—destined with humanitarian supplies for Angola. Although I don’t recall the names of any of the Finns I spoke to, I remember clearly how friendly they were to me (the only American at the conference in post-9/11 days) and how earnest they were about the symbolism and the impact of a Fair Trade journey from their country's shores to Africa. Those good people of Finland have been on my mind this month as the United States has endeavored to win back from Finland the record for World’s Largest Fair Trade Break. 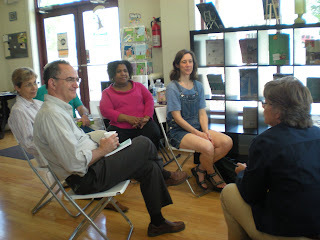 I did my part at an event in Hyattsville, Maryland, hosted by the Book Nook and featuring Ten Thousand Villages from Alexandria, Virginia. Although the results won’t be out for another week or so, there is a small part of my American heart rooting for the Finns to retain the record. In fact, some of these topics were conspired at the Fair Trade Futures conference I helped convene in 2005 in Chicago. Does this mean that the Fair Trade movement is stuck, asking the same questions over and over but not getting anywhere? Or is this a reflection of how young the movement is—asking itself essential questions of identity and power? For me, I think it is a little bit of both. But more that that, it is a sign that the movement is small and still shaped by a relative handful of organizations and individuals, here and around the world. We keep having conferences—and I am working to make another event happen here in the States in 2010—for a couple of reasons: some questions are perennial and unanswerable, for one thing. Also, the movement is young and attracting fresh interest in different communities throughout the world. And, to expand and diversify, the movement needs events and meeting places to attract new voices and views. At the 2002 conference in Belgium, someone at a plenary challenged, “We say we are a movement, let’s move!” With another successful World Fair Trade Day celebrated in 80 countries, I think we can take satisfaction that we are moving forward. Maybe we are slow, like a cargo ship, but we have creativity, commitment. Millions of struggling artisans and farmers are willing to join us on the journey. Purchase "Fair Trade: A Beginner's Guide"
Besides asking your local bookstore or library to order a copy, copies are being offered for $5 by one of my favorite coffee companies, Peace Coffee in Minneapolis. You can also find the paperback through Amazon, including a Kindle version. For audio versions, please contact Bolinda Publishing. If you need bulk quantities, please contact Publishers Group West for wholesale possibilities. If you are an educator, Rosen Publishing has released a hardcover edition for libraries.